Gardeners can enjoy their hobby all year round with a Rogers’s greenhouse. Greenhouses can be beautiful and useful structures for a gardener creating an ideal environment to grow your own colourful annuals, perennials, vegetables, herbs or tropical and exotic plants or the ever-popular winter garden. Know where your food comes from, with your own private greenhouse you can start your vegetables and herbs that you’ve grown from seed. Just imagine! Things to consider when selecting the best greenhouse for you! Do you want a freestanding or lean-to house? What do you hope to grow in your greenhouse? How many seasons of the year will it be in use? Will you be heating the house? The first decision when selecting a greenhouse is to decide whether you want a free standing or attached model. Freestanding allows you to select the appropriate site to maximize sunlight exposure and aesthetic appeal. 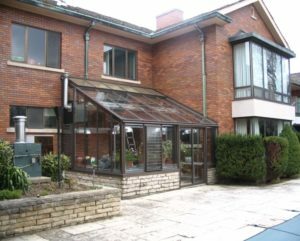 Attached greenhouses offer the convenience of access to services, heating, and hydro, water, and added insulation, ease of access in inclement weather and good use of yard space. Typically, any structure under 100 square feet does not require a building permit. Always check municipal building codes. 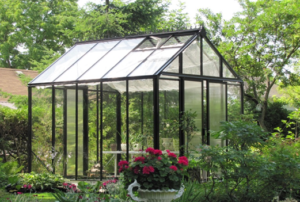 Rogers Custom Greenhouses offer a variety of greenhouse kits to suite everyone’s needs and budget. All Rogers freestanding hobby greenhouse kits are prefabricated ready to assemble and include a fully illustrated easy to follow instruction manual that will takes on average, a weekend to build. Rogers’s benches have been designed with the grower in mind. Benching is prefabricated in our shop using rust-free aluminum framing and galvanized hardware. Soil and water drop right through the bench – eliminating weed, soil and water accumulation. Low Cost – You’ll find this bench to be more economical than most bench material now used. 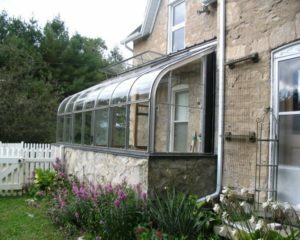 Attached, or lean-to greenhouses, are designed to attach directly to your home, garage or any existing external wall provided there is enough height to accommodate the height. Many people find lean-to greenhouses easily accessible and convenient when installing the necessary power and water connections. The home-attached is a must for those wanting to extend the season and enjoy the view into the garden. Standard and custom sizes are available. All models are prefabricated ready to assemble, installation is available. Contact us to discuss your greenhouse needs and to get a free quote.